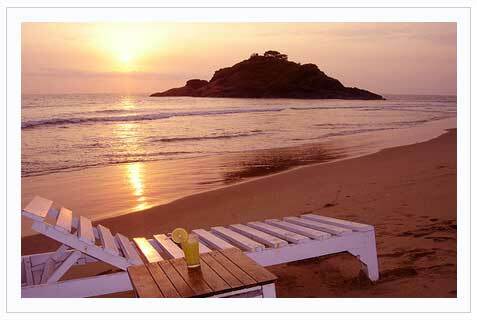 Devbagh beach resort is situated at devbagh, an island off karwar. Activities which are different from other beach locations include chasing crabs, building sand castles, beach combing and wading into the not at all crowded sea. For the adventurous, snorkelling, speed boat cruise, banana boat ride, water scooter, kayaking and more possible ( subject to weather conditions). There are no a/c rooms, swimming pool, indoor games, health club etc. over here. Just the calm, private beach exclusive to you and your family. Cost includes stay, all meals, boat ride, camp fire and taxes. Water sports/ snorkelling at an additional cost, subject to weather conditions. Air conditioning in the rooms will be at an extra price of Rs. 500 per person for indians & $10 for foreigners. Single occupancy charges will be Rs. 1100/- per person for indians & Rs. 1700/- extra for foreigners. Karwar is 2 hour drive from Dabolim Airport. People can take konkan rail also and get down at Goa or Ankola. Bangalore to karwar is app. 500+ kms and requires a overnight journey, via hubli. Plenty of private/ government buses ply between Bangalore to karwar. On arrival, visit Jungle Lodges office, opp. Hotel Bhadra for a complimentary boat transfer. Advisable to reach karwar before sunset.